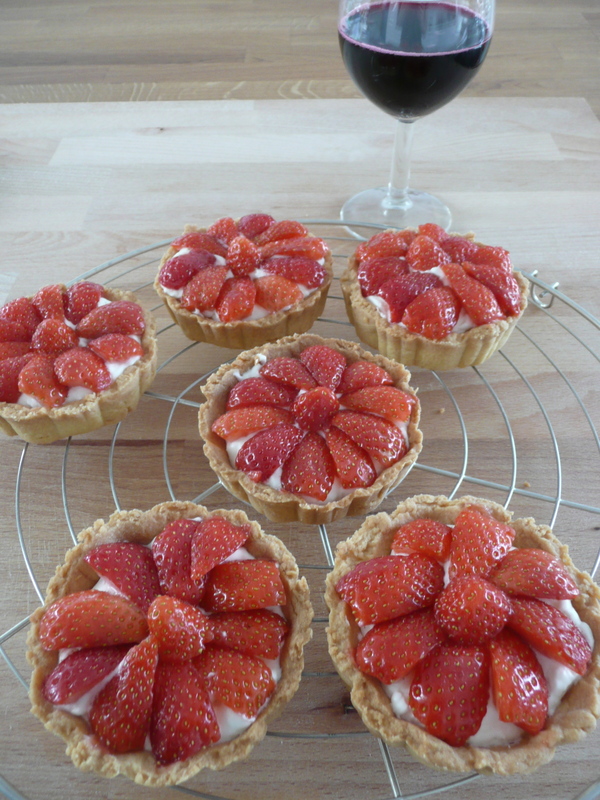 First, I made the tart cases. I still had some dough in the freezer from making my lemon tart because I always make double and freeze half. For half of the dough (it resulted in about 10 tarts), mix 250 g plain flour and 70 g icing sugar in a bowl. Rub 125 g cubed butter into the flour with your fingers until crumbly. Mix in 2 egg yolks and roll into a ball. Flatten out the pastry with your hands, wrap the dough in cling film, then chill for at least 30 mins. After 30 min, roll out the pastry on a lightly floured surface to about the thickness of a £1 coin, then lift into your small tart cases. Press down gently on the bottom and sides, then trim off any excess pastry. Stab a few holes in the bottom with a fork and put back in the fridge for 30 min. Heat the oven to 140 C. Line the tarts with foil and fill with rice or dried beans. Bake for 10 min, then remove the tart tin from the oven, discard the foil, and bake for another 20 min until biscuity. Take out of the oven and leave to cool in the tin for 5 min before turning out onto a wire rack to cool completely. Of course you can also use shop bought crust pastry instead. For the filling, I used the filling from my raspberry tart: whisk 200 ml crème fraîche until firm (it needs to be cold, otherwise you’ll have difficulty whisking it, so don’t take it out of the fridge until you are ready to use it). Then add 85 g caster sugar, 1/2 tsp vanilla essence and the juice and zest of 1/2 lemon. Whisk again to get a thick cream. Spread over the bottom of the tart cases. Finally top with your favourite fruit, I used strawberries (you’ll need about 200 g) but it will work with any type of food you fancy. Enjoy! On our recent holiday to the south of England, I tried basil panna cotta at the Gurnard’s head in Cornwall. I didn’t really have much room for a dessert, but when I saw it on the menu, I just had to try it. It was so good, I decided to make it myself. I searched online for good recipes but found nothing to my liking so I decided to adapt a Lorraine Pascale recipe. The result was a big hit with our guests, although I did keep most of it for myself! 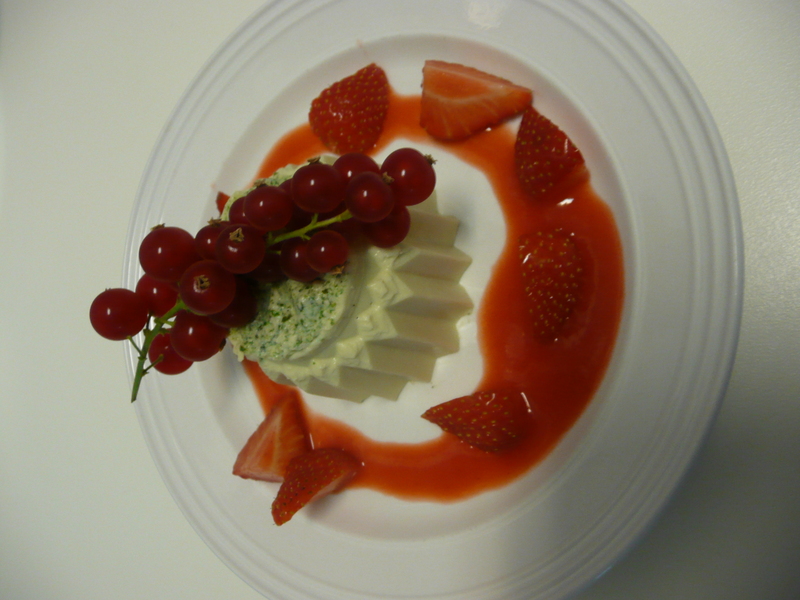 Don’t be daunted: panna cotta is the easiest thing to make! Here’s how: put 4 leaves of gelatine in a bowl of cold water (they have to be fully covered) and set aside for 5 min. In the mean time, put 300 ml double cream or whipping cream (you need at least 30% fat contents) in a pan with 250 g mascarpone, 100 g caster sugar and the seeds of a vanilla pod (add the pod as well for extra taste) and stir to combine. Gently heat the mixture while stirring occasionally until it’s almost boiling. Take of the heat and add the leaves of two bunches of basil (you really need a lot of it) and stir for 2 min until the basil is wilted. Using a stick blender, mix until you get an even green mix. Add the gelatine leaves one by one (squeeze out all the water first) and stir well. Pour the mixture into dariole moulds and put in the fridge to set for 2-3 hours or overnight. To serve, make a strawberry sauce by mixing a handful of strawberries with 1 tbsp icing sugar. Push through a sieve if you prefer. Cut some more strawberries for decoration. To unmould the panna cotta, dip the bottom of the moulds in hot water for a few seconds to loosen them, then turn them upside down on a serving plate. They may need a few sharp jerks of the hand for them to come out. If this fails, run a small knife around the side of the mould to loosen slightly. Or just don’t bother taking them out of the moulds at all. Enjoy while listening to Strawberry Fields Forever by the Beatles. This recipe is really versatile, if basil is not to your taste, you can add anything you want. Bear in mind that when adding sweet elements, you may need to reduce the amount of sugar. 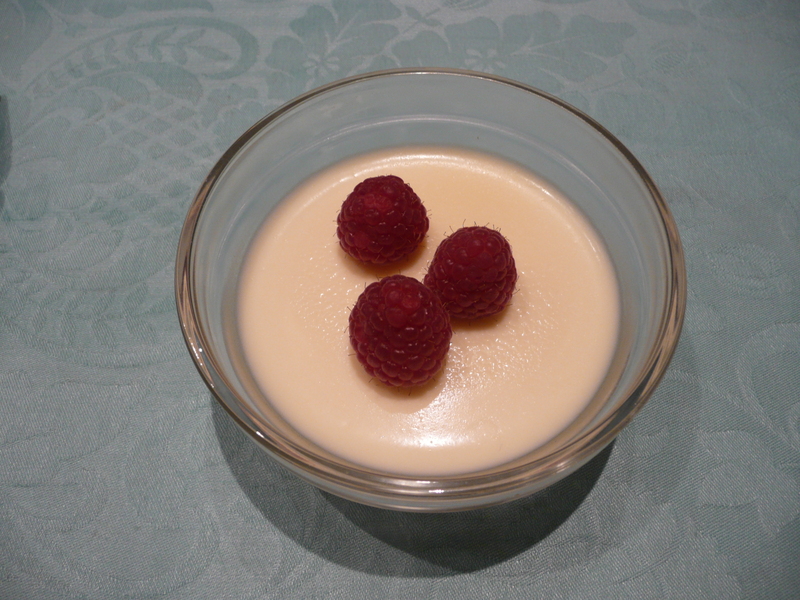 Lorraine Pascale went for a white chocolate panna cotta: to do so, stick to the above recipe but don’t add any sugar at all. When taking the mixture of the heat, add 100 g of white chocolate, instead of the basil, and stir until melted. 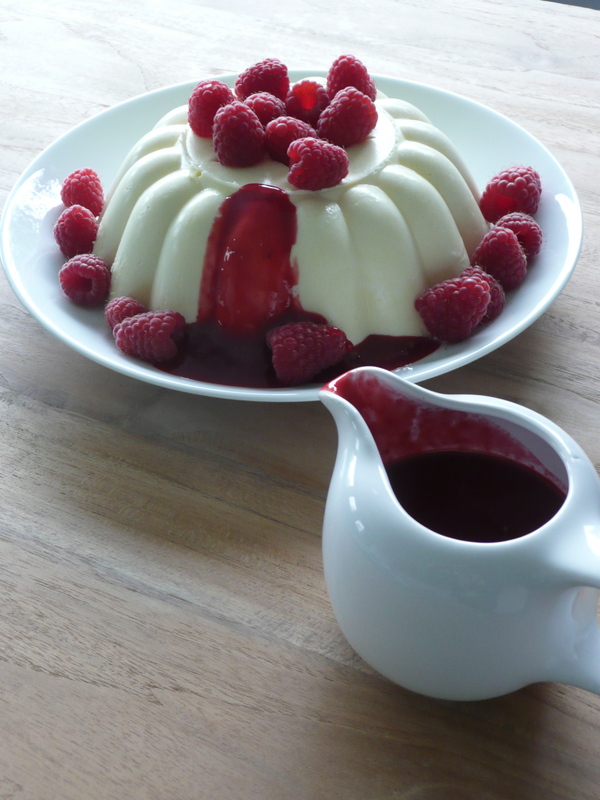 Serve with raspberry coulis and extra raspberries. Use up leftover mascarpone in speculamisu, raspberry and orange tiramisu or strawberries with balsamic vinegar. I needed a gift for a late Easter lunch invitation. Usually, I go with cookies as they are so fast to make and always a winner. But for a festive occasion I wanted something with a bit more glam and came across this recipe in a recent GoodFood magazine. I have several recipes for truffles, but I really like this one as it only contains chocolate and cream. Other recipes I’ve come across also add butter and sugar, but I think that’s a bit too much of the good stuff! I’ll get to the recipe in a minute, but I first wanted to introduce something new: music. In my house, there is always music and the first thing I do when I start cooking is putting some music one. Meals are always accompanied with music too, so I thought it only natural to start adding music to my blog. So for each recipe, I’ll give a tip for a song to listen to when enjoying your homemade goodies! Now it’s time to get you started on those truffles: gently heat 150 ml double cream (use cream with at least 33% fat contents) in a pan. When hot (almost boiling), remove the pan from the heat and leave to stand for 1 min. Add 100 g dark chocolate (chopped into small pieces) and 100 g milk chocolate (chopped into small pieces as well) and stir until melted and smooth. Pour the mixture into a bowl and chill in the fridge until firm (overnight is easiest). Put 2 tbsp of cacao powder in a bowl and put 50 g chopped hazelnuts in another bowl. 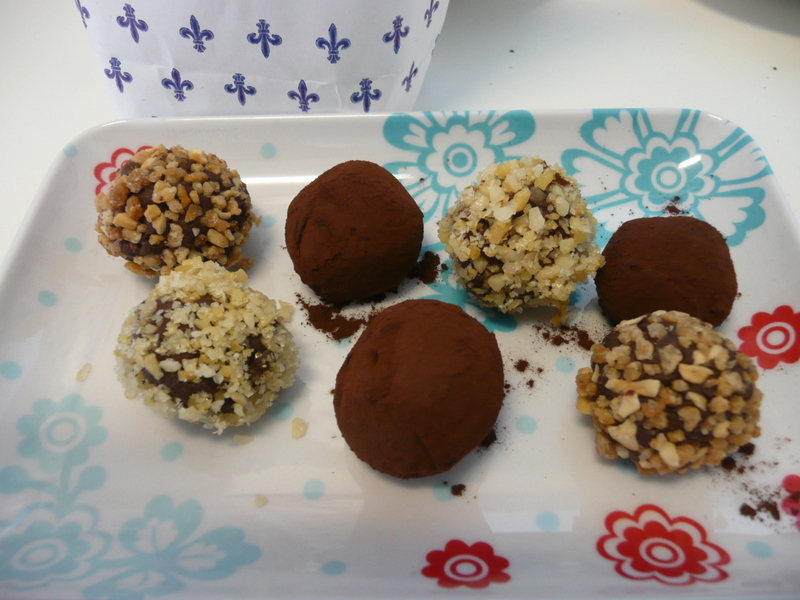 Take your firm chocolate and spoon a teaspoon on your hand and roll to a ball. Now put it in the bowl with the cacao and toss it around to coat. Repeat with the rest of the chocolate and either coat it in nuts or in cacao. Keep in the fridge until ready to serve. The ideal song to play while enjoying this treat is very obvious so no surprises there, it has to be Chocolate salty balls by Chef from Southpark, have fun! My mom stopped asking what I want to eat on my birthday as the answer has been the same for ages: bavarois! I totally love this and after a dinner party with this dessert, my boyfriend regularly catches me with my head in the fridge the day after, secretly getting some extra bites. If I’m not careful, I’ll eat the whole lot! I checked for the English name, but apart from “bavarian cream” I didn’t find anything else, so I’m sticking to Bavarois on this one. It’s basically cream, eggs, sugar and milk so only the good stuff! You need to make it a day ahead, but you can easily make it more than 1 day ahead, it will happily sit in your fridge for over a week, that is if nobody secretly eats it in the mean time! Here’s how to do it: soak 16 g of gelatin leaves in cold water for later use. Mix 250 g caster sugar with 6 egg yolks until they are pale and creamy (you don’t need the egg whites for this recipe, but you don’t need to throw them away: make some meringues on the spot, or just freeze them for later. You can simply defrost them afterwards and use as needed, for example to make macaroons). You can do this in a big cooking pot as it will need to go on the hob later. In the mean time, bring 1/2 liter milk to the boil. Gently add the boiling milk in small amounts to the egg mix while mixing constantly. Now put this mix on the hob until it thickens. You don’t want it to boil, so keep an eye on it. As soon as it starts to increase in volume, you know it’s almost boiling and you can take it of the hob. Now add the gelatin leaves one by one (squeeze all the water out of them first) and stir them into the mix. Cool the mix by putting the pot in a sink filled with cold water (au bain marie). Leave it to cool for at least half an hour. Stir it every now and then to avoid it stiffening too much. If it’s getting too stiff already, just take it out of the water and get on with the next step. If on the contrary it’s still very runny after more then half an hour, don’t panic: it will turn out just as great! Next up is the cream: beat 1/2 liter double cream until it’s stiff. You don’t want it to be too stiff, that will make it difficult to add it to the egg mix, stop when you can see the traces of your mixer and it already thickened considerably. Add 1 tbsp icing sugar to the cream and mix again. Now add the cream to the egg mix, stirring until it’s all incorporated. Poor the mix into a mould that you lightly greased with some oil (this makes it easier to get it out again), preferably not a metal mould (don’t ask me why, my mom’s recipe just mentions this, I’m sure it’s granny wisdom that thus cannot be ignored). Put it in the fridge overnight (or longer) until it’s firm. A good way to test it, is to poor whatever bit of mix you have left in a small bowl so you have a “testing bowl”, every good cook needs to try everything before serving! When you’re ready to serve, turn it out onto a plate and hope for the best! The easiest way to loosen it is by hitting the side of your mould on the kitchen counter (you might want to put a towel in between not to alarm your guests with the noise) and work your way round so it comes loose from the sides. As soon as you get some air in it, it will loosen all the way round. Then turn it upside down on the serving plate, hit a few more times and peak a bit to see if it did the trick! Serve with raspberry coulis (shop bought will do just fine, you’ll find it in the fridge or in the freezer) and some fresh raspberries for that extra wow factor. Obviously, strawberries or other berries will work just s well. Enjoy!